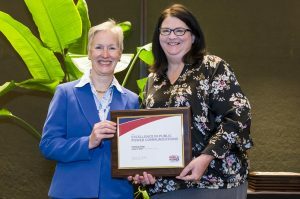 Conway Corp Chief Marketing Officer Crystal Kemp (right) accepts an APPA Award of Excellence from Sue Kelly, president and CEO for APPA. Conway Corp has been awarded an Award of Excellence in the Web and Social Media Category and the Print and Digital Category from the American Public Power Association. APPA conducts the Excellence in Public Power Communications awards to encourage and recognize excellence in communications. Awards were given to utilities that showed ingenuity and creativity in copy, design, financial data, graphics, organization, social media interaction, video editing, web layout and interactivity, as well as in communicating the utility’s special story. In the Web and Social Media Category, Conway Corp was honored for its Lineman of the Week social media video series. Each week during the high school football season, these videos spotlight a Conway High School lineman and one of Conway Corp’s Electric linemen. The company was also honored in the Print and Digital Category for its development of Lineman Trading Cards. The card features a photo of the employee, career highlights and electric safety tips. Conway Corp lineman hand the cards out when they are doing school or community programs. Chief Marketing Officer Crystal Kemp accepted the award at the APPA Customer Connections Conference in Orlando, Fla. The winning projects were led by Kemp, Senior Marketing Coordinator Beth McCullough Jimmerson and Public Relations Coordinator Jeff Matthews.